Installing a commercial barrier for your property requires you to take some major considerations in mind. If you’re looking to add a fence or louver to your commercial property, you already know the many benefits. With that said, it’s not always clear what you should be looking for. Security, privacy, and aesthetics are all elements that most business owners care about, as well as maintenance and cost. Because purchasing a commercial barrier is such a major investment, it’s important to make all the right considerations and really compare options out there. Today, we want to highlight two of the biggest concerns that anyone purchasing a commercial barrier has, and how you navigate those concerns to find the right option for you. Privacy and security are two ideas that are inextricably linked together. Being able to protect yourself, whether physically or even just visually, is an important part of what goes on with many businesses. A fence or barrier like a louver can be a key factor in making sure that you’re protected. Louvers, for example, are very difficult to get over or even see through, all while still offering the traditional benefits of fences, like not making a space feel entirely closed off. 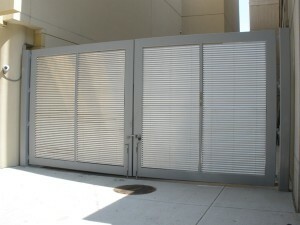 It’s important to pick a commercial barrier that is made of a strong, durable material that makes it difficult for any potential intruders or robbers to get past it. Just remember that some types of fences are easier to climb over or see through than others, so if security and privacy are major concerns of yours, let your fence installer know and they can assist you in finding the right option. Talking about aesthetics when it comes to something so practical may seem frivolous, but any business knows the importance in maintaining a certain image. You want to find something that’s easy on the eyes and makes you look professional and buttoned-up. Something like chain link fences are a pretty industrial look that are suitable in some instances but not in others. If you keep your property looking clean and well-maintained and pick a commercial barrier to match, people will be much more likely to want to do business with you. This entry was posted on Friday, October 5th, 2018	at 12:35 pm	. You can follow any responses to this entry through the RSS 2.0 feed. Both comments and pings are currently closed.